(Reuters) - A student at Marjory Stoneman Douglas High School in Florida has died in "an apparent suicide," police said on Sunday, less than a week after a 19-year-old survivor of the 2018 massacre at the school took her own life. The student's death occurred on Saturday evening and is under investigation, said Coral Springs Police spokesman Tyler Reik. The student's name, age and gender were not disclosed, he said. “We’re calling it an apparent suicide because we don’t have the exact results back from the medical examiner’s office,” Reik said by phone. The Miami Herald reported that the suicide victim was a male sophomore who attend the Parkland, Florida, school when 14 other students and three staff members were killed on Feb. 14, 2018, in the deadliest-ever U.S. high school shooting. A week ago, former Marjory Stoneman Douglas student Sydney Aiello took her own life, according to her family. Aiello, who survived the 2018 shooting, was suffering from survivor's guilt and had been diagnosed with post-traumatic stress disorder, her mother told CBS Miami. Aiello was a senior at Stoneman Douglas when a former student with a semi-automatic rifle shot dead her friend Meadow Pollack, the family said. 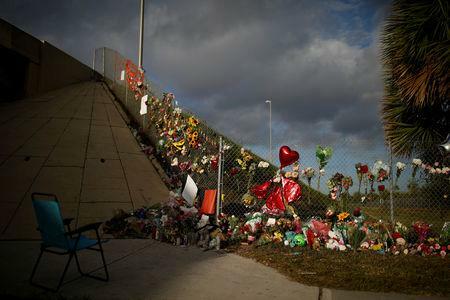 The deaths drew calls in Florida for increased spending on mental health services for the Marjory Stoneman Douglas High School community and other schools. "Now is the time for the Florida Legislature to help," Jared Moskowitz, Florida’s emergency management director and a former state representative from Parkland, posted on Twitter. David Hogg, who survived the 2018 shooting and became a gun control advocate, said schools needed serious mental health funding and proper guidance counselors. "How many more kids have to be taken from us as a result of suicide for the government/school district to do anything?" he tweeted.